The brilliant new book from bestselling author Jacqueline Wilson, set in the children's ward of a 1950s hospital. It's 1953, the year Elizabeth is to be crowned Queen of England. Elsie Kettle can't wait to go to London to see the celebrations on Coronation Day. Elsie lives with her Nan - her mum works as a showgirl, so she's not around very often. Spirited and imaginative, but often lonely, Elsie longs for a best friend. Luckily, she and Nan are very close; Elsie just wishes she was allowed a cat to keep her company sometimes. Then tragedy strikes. Nan and Elsie both fall ill with tuberculosis, and Elsie finds herself whisked away to the children's ward of the hospital. Confined to bed for months on end, Elsie finds it very hard to adapt to the hospital's strict regime. 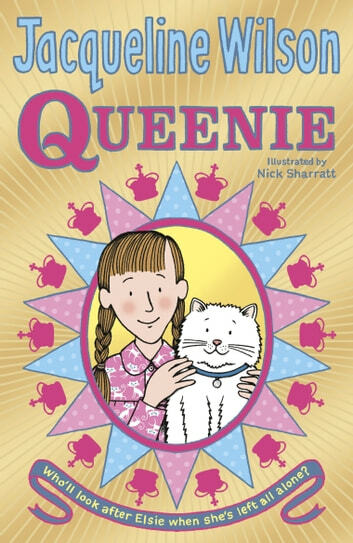 But she invents astonishing ways of entertaining the other children on the ward, and for the first time finds herself surrounded by true friends - including Queenie, the hospital's majestic white cat. I have read the book version of this and it really touched my heart . THis book brings all the elements of English together.Very inspiring and is THE must read. THE MUST READ!!!!! This is an amazing book about a girl who gets TB and has to learn to fit in, in a hospital. She also has to learn to cope with her TB. It was a simply amazing book. Perfect for JW fans and Hetty Feather fans this will have you begging for more. I hope there is a sequel to this book.